Taunton Concert Band is delighted to bring their annual Christmas Concert to you at Queen’s College for the first time. 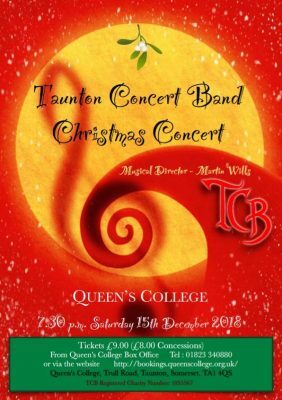 We are planning to have an evening full of festive frivolity and cheer under the musical direction of Martin Wills but do listen out for the occasional adventure into the darker side… a minor misdemeanour perhaps? All will be revealed as we invite you to step away from the hustle and bustle of your own Christmas preparations and treat yourself to a little musical respite.